Astronomers studying the Milky Way have discovered a large number of previously-unknown regions where massive stars are being formed. Their discovery provides important new information about the structure of our home Galaxy and promises to yield new clues about the chemical composition of the Galaxy. "We can clearly relate the locations of these star-forming sites to the overall structure of the Galaxy. Further studies will allow us to better understand the process of star formation and to compare the chemical composition of such sites at widely different distances from the Galaxy's center," said Thomas Bania, of Boston University. Bania worked with Loren Anderson of the Astrophysical Laboratory of Marseille in France, Dana Balser of the National Radio Astronomy Observatory (NRAO), and Robert Rood of the University of Virginia. The scientists presented their findings to the American Astronomical Society's meeting in Miami, Florida. The star-forming regions the astronomers sought, called H II regions, are sites where hydrogen atoms are ionized, or stripped of their electrons, by the intense radiation of the massive, young stars. To find these regions hidden from visible-light detection by the Milky Way's gas and dust, the researchers used infrared and radio telescopes. "We found our targets by using the results of infrared surveys done with NASA's Spitzer Space Telescope and of surveys done with the National Science Foundation's (NSF) Very Large Array (VLA) radio telescope," Anderson said. "Objects that appear bright in both the Spitzer and VLA images we studied are good candidates for H II regions," he explained. The astronomers then used the NSF's giant Robert C. Byrd Green Bank Telescope (GBT) in West Virginia, an extremely sensitive radio telescope. With the GBT, they were able to detect specific radio frequencies emitted by electrons as they recombined with protons to form hydrogen. This evidence of recombination confirmed that the regions contained ionized hydrogen and thus are H II regions. Further analysis allowed the astronomers to determine the locations of the H II regions. They found concentrations of the regions at the end of the Galaxy's central bar and in its spiral arms. 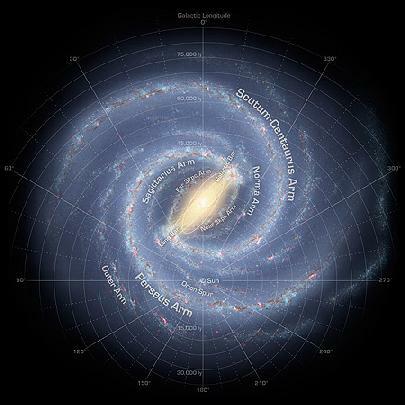 Their analysis also showed that 25 of the regions are farther from the Galaxy's center than the Sun. "Finding the ones beyond the solar orbit is important, because studying them will provide important information about the chemical evolution of the Galaxy. There is evidence that the abundance of heavy elements changes with increasing distance from the Galactic center. We now have many more objects to study and improve our understanding of this effect," Bania said.